NOTE: FULL ROUTE IS ROUGHLY 8 1/2 MILES. NOTICE THE MAP HAS MILE MARKERS ON IT AND THERE ARE MILE MARKERS SIGNS ON THE LEFT HAND SIDE OF THE RIVER AS YOU PADDLE DOWNSTREAM. THE END OF THE TRIP AT THE ATWOOD PARK CANOE LANDING IS ROUGHLY AT THE 5 & 3/4 MILE MARKER SIGN ON THE LEFT HAND SIDE OF THE RIVER. 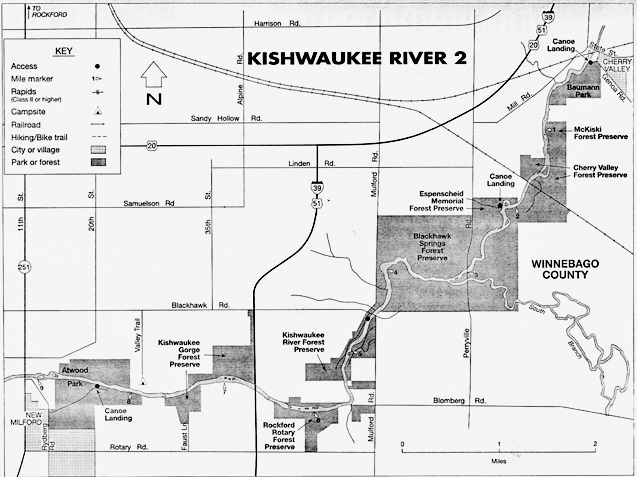 Map copied from 'The Paddling Illinois Book'. *CANOE LANDING (SEE MAP BELOW) IS AT ATWOOD PARK AND PRAIRIE IN NEW MILFORD, ILLINOIS. YOU WILL PARK YOUR VEHICLES AT THE CANOE LANDING AND THEN WE SHUTTLE YOU TO THE CANOE LAUNCH, SO YOUR VEHICLES WILL BE AT THE LANDING WHEN YOU FLOAT BACK DOWNSTREAM. *ENTRANCE TO THE ATWOOD PARK CANOE LANDING (SEE MAP BELOW) IS ON RYDBERG ROAD WHICH IS OFF OF ROUTE 251 OR ROTARY ROAD IN NEW MILFORD, IL. (SEE LOWER LEFT CORNER OF MAP.) THE ENTRANCE TO THE PARK IS MARKED BY TWO TALL TAN COLORED STONES ON EITHER SIDE OF THE ENTRANCE AND THERE IS A SIGN WITH AN OWL THAT SAYS ATWOOD PARK AND PRAIRIE. YOU THEN DRIVE INTO THE PARK AND DRIVE DOWN TO THE PARKING LOT NEXT TO THE RIVER WHERE THE WHITE WALK BRIDGE IS. NOTE: THERE IS NO GPS ADDRESS FOR THE CANOE LANDING AT ATWOOD PARK ON GOOGLE MAPS SO YOU CAN GPS THE ADDRESS FOR THE VICTORY BAPTIST CHURCH THAT IS RIGHT ACROSS THE STREET FROM THE PARK ENTRANCE. THAT ADDRESS IS: 7028 RYDBERG ROAD IN NEW MILFORD, ILLINOIS. A new Illinois law beginning June 1st 2018, requires that all renters must watch these safety videos and take a short test before they embark on thier river adventure. We have provided a link to the online site and a link to each individual video for your convience. All customers will be required to sign off with Kishwaukee Canoe they complied with this new law.